She did not know that she was a witch when she was married yet they say she was born that way; or was she simply born a woman, bewitching to the men around her without any presumption of inherent evil, hungry for more than was her lot, desiring and hunting in the way the men desire and hunt both her and the white reindeer, rare and elusive? Her name is Pirita, and in the magnificent snow-blown plains of Finnish Lapland she and her new husband Aslak are happy, their shared life joyful despite the harshness, the sparse, bare trees, the wolves howling in the freezing drifts in the night, finding warmth even in the unending cold of the far north. 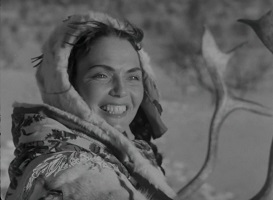 A reindeer herder, Aslak must return to tend to the animals in their migrations, leaving Pirita alone for long stretches and in her frustration she visits the tribal shaman Tsalkku-Nilla and begs him to make her desirable to men; inevitably, there is a cost to her and the community. Told that she must make a sacrifice to the Stone God of the first living thing she encounters on her way home, it is the white reindeer, the young animal Aslak gifted to her to keep her company in his absence, and the terrible curse is sealed. Directed by Erik Blomberg from a script developed in collaboration with his leading lady, muse and wife Mirjami Kuosmanen who appears in the dual roles of both Pirita and her mother Maarita, The White Reindeer, known as Valkoinen peura in its native Finland and Den Vita Renen in Sweden, has been remastered for Blu-ray by the National Audiovisual Institute of Finland. 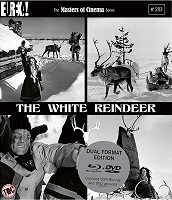 Whether viewed as a fairy tale, a folk legend, a horror story or simply a classic human drama of world cinema, a vision of a culture both different and recognisable, The White Reindeer was originally released in 1952 and won numerous accolades in the following years at Cannes and the Golden Globes as well as at home in the Jussi awards. The driving desire of the abandoned woman a universal theme, so is the mythology of transformation into a beast preserved across cultures, as is the story of a loved one who is then slain by accident recurrent from ancient times to modern, Blomberg’s work frozen in a forgotten moment yet timeless, a monochrome window on another world. 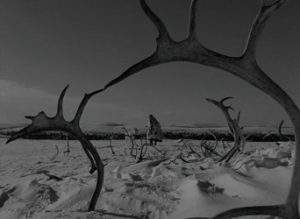 With Blomberg also serving as cinematographer and editor, his landscapes are eerie, almost supernatural, and even considered purely as a technical exercise The White Reindeer is stunning in this flawless print, crisp as new fallen snow, sharp as ice and with the shade and texture of clear winter nights and flickering firelight. Accompanied by a commentary by film historian Kat Ellinger and a short audio essay by writer Amy Simmons, they consider the atypically complex presentation of witchcraft as empowering to women in a patriarchal society and draw comparisons with significant works within the diverse subgenres of horror, from Benjamin Christensen’s Häxan and Jacques Tourneur’s Cat People to Neil Jordan’s The Company of Wolves. 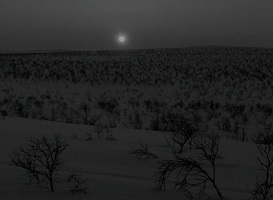 A hypnotic tragedy of hot blood and cold iron which runs to just over an hour, the narrative is thin and for long stretches non-verbal, The White Reindeer an experience rather than a narrative carried by the stunning locations, Einar Englund’s soundtrack and Kuosmanen’s lustful and tortured performance and the innocence of the astonishingly cooperative herds of wild animals.